Cedar apple rust in “full bloom,” with hydrated spore horns. What the overwintering cedar apple rust body looks like before spring comes. Crested iris leaves push through the forest’s leaf litter. Poke sallet plant sends its first leaves between the rocks. We were somewhat concerned that the irises might not make it this year. With the hundreds of trees damaged from last year’s snow, and the subsequent efforts to trim and remove debris from the road, we feared the irises might be disturbed or buried under pine logs and brush. It was great to see yesterday that those leaves had emerged. 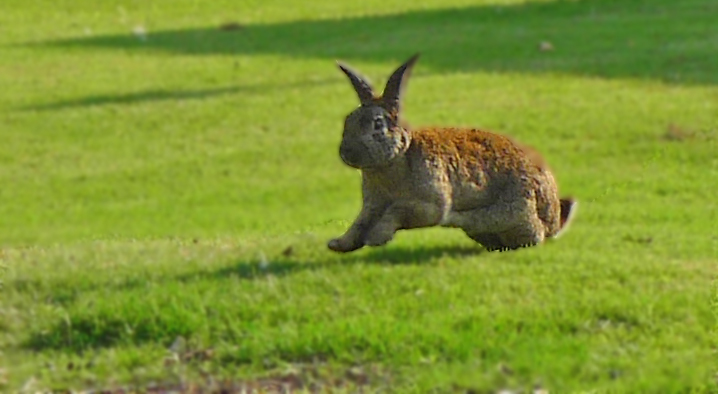 GALLOOMPHING – This large rabbit didn’t so much hop as galloomphed his way around the grounds of a local nursing home. He and a friend have free run of the place to the delight of patients and visitors. 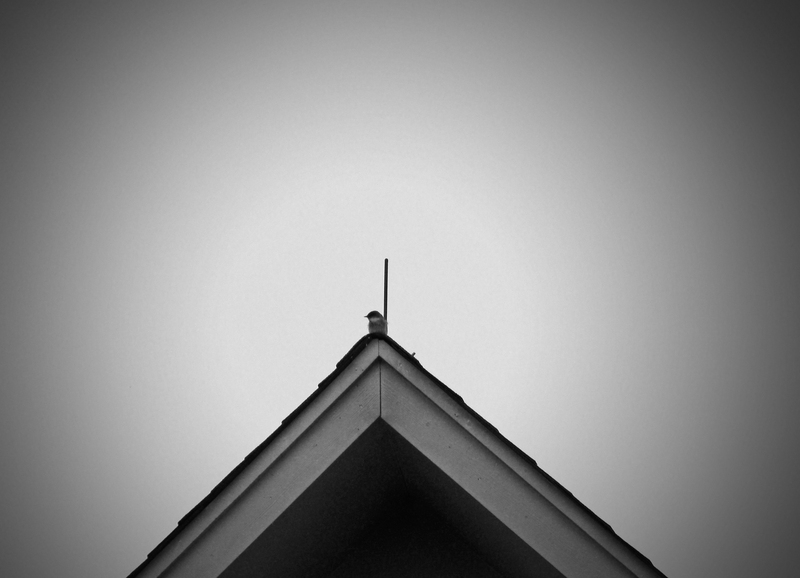 A little bird with a big set of lungs sat singing atop the neighbor’s roof yesterday. The Ouachitas got a little bit of rain over the last couple of days. This morning, the clouds parted perhaps long enough for the Easter sunrise service down by the Arkansas River, but it wasn’t long before the dark stormclouds were again in full throat. The rain fell so hard at 8 a.m. Mass, the pastor said he could barely hear anything above the din of the drops battering the roof. During yesterday’s walkabout, water was everywhere from tiny drip-drip-drips from the edge of a stone to white mini-rapids in the deepest part of the valley. Tiny streams of water fall through the fissures in the shale. Water comes flying down the mountain, carving the shale as it goes. Closer to the bottom of the mountain, the stream and its falls widened a bit. This is really only a couple of minutes in a day in my life (yesterday, for that matter.) You could hear the peeping from down the hall: A basket of little yellow chicks. Not for Easter, but for the start of a 4-H project teaching kids how to raise chickens. One chick, cradled by a co-worker, fell asleep in her warm palm, or simply found our department boring. * A more detailed post, perhaps, after Easter. BIRD IN HAND — Chick visits the office. BORING — What chick thinks of our office after just two minutes. *No, having poultry or other livestock in our office is not typical. The phone rang. 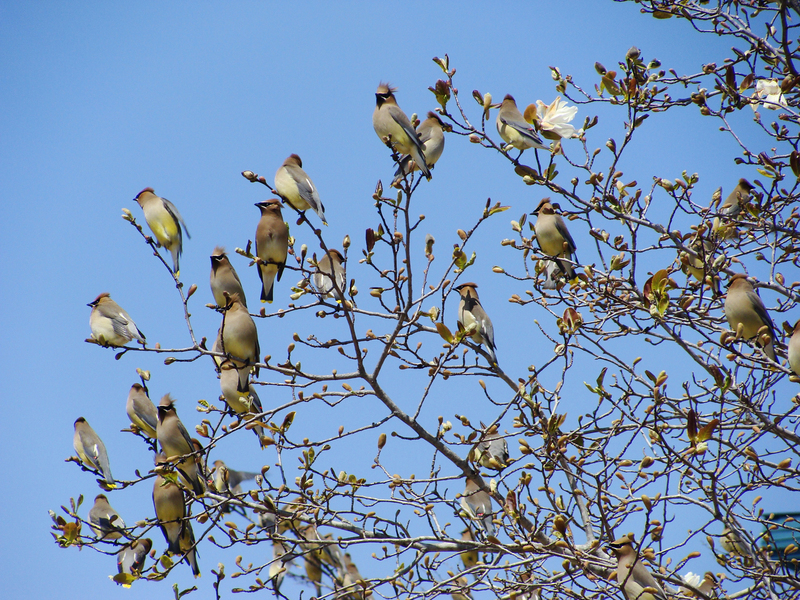 A colleague upstairs called to see if I’d seen the flocks of cedar waxwings sweeping and swirling from tree to tree around the office grounds and adjacent campus. The birds moved almost as one; stripping the hollies of their berries and continually finding new places to roost. Waxwings are beautiful birds with their masks and crests. Look closely and you can see accents of bright yellow and pink in tips of their wings and tails. TREEFULL – Masked birds outnumber blooms on the branches of this tulip tree. 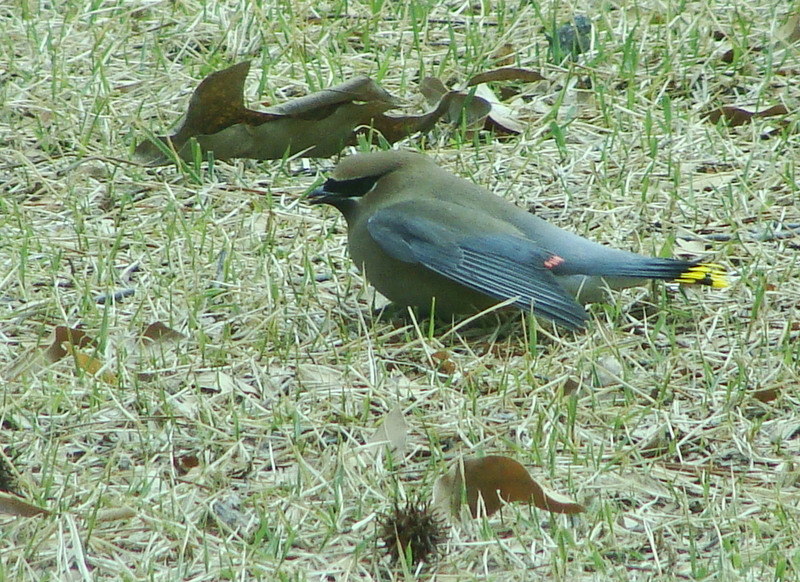 DOWN — Injured waxwing rests in the grass. He fell in a sort of spiraling flat spin like an autumn leaf. Perhaps he was dazed after a collision? Sadly, an hour later, his head tipped forward. His beak to the ground, he expired. A lot of America appears to be suffering from winter fatigue, cabin fever or related disorders that result from a prolonged battle against cold, snow, snirt, ice, power outages and indignant derriere landings thanks to any number of slick frozen water combinations. This headline from a CBS story today says it all: The calendar may say spring, but the forecast says snow. Where’s Perry Mason when you need him? 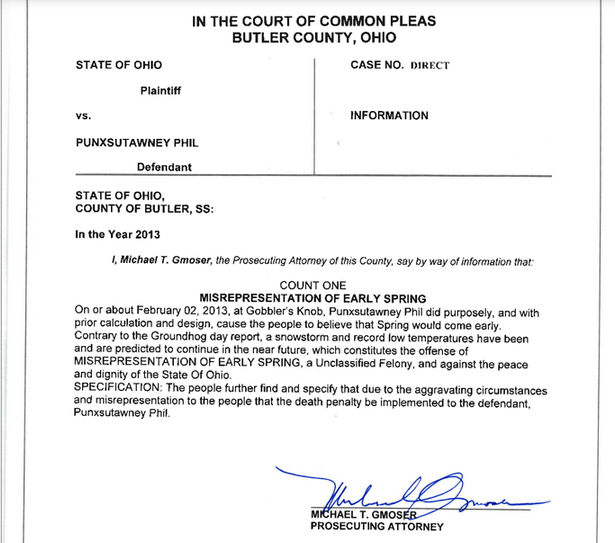 When it comes to whistlepig prognosticators, our money is on Perry County Blossom, who this year predicted six more weeks of winter. Blossom spokescouple Jack and Tamara also report that Blossom has had a litter. We hope to have a new photo or two of Blossom as spring progresses and she can leave her den. And one more note about folkways forecasting. It seems the persimmon seeds were right this year. The wet winter has been welcome in the half of Arkansas still in drought. 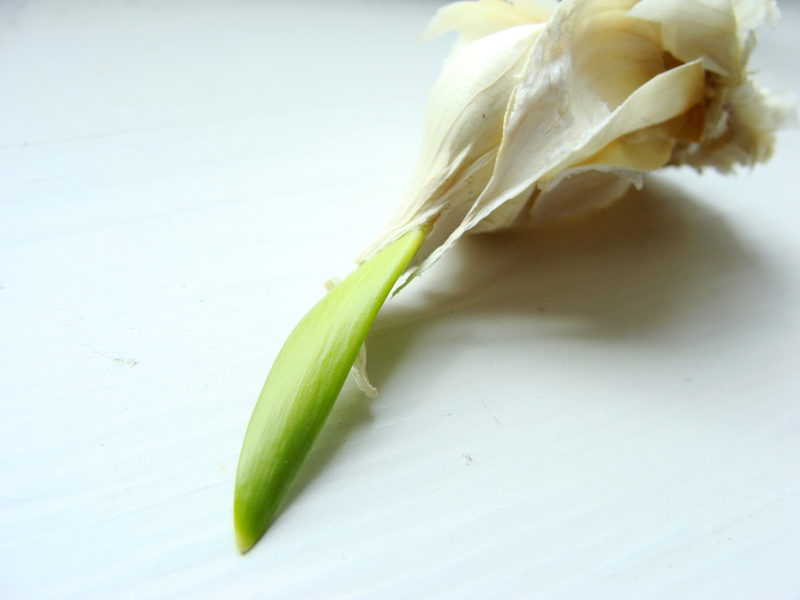 Found hiding behind the cutting board, this garlic clove’s growth spurt ensures its future will be in the kitchen garden and not in the paella. Garlic clove does not wait for a future in the pot. Even if everything else is slow to grow this spring, the dandelions are not. Time, weather and insects become scrimshanders of sorts. 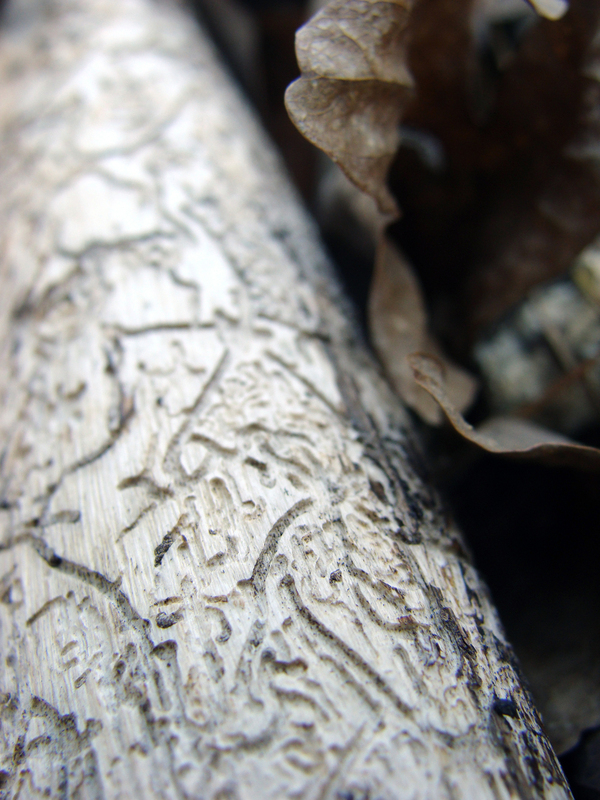 Ghostly and weather-bleached, this branch shows scrollwork etched by insects.